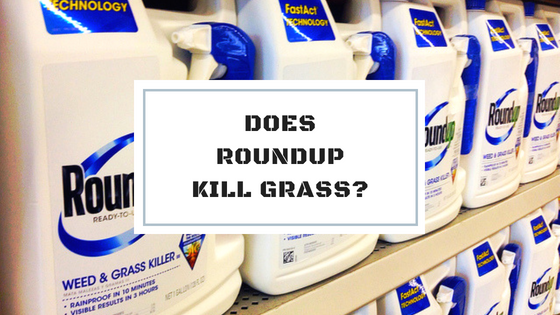 Q: Does Roundup kill grass? A: Yes, Roundup (as pictured above) is an effective way to kill both grass and weeds down to the root. 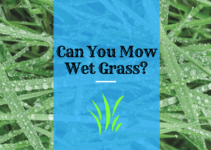 It is commonly used to kill an existing lawn so that it can be seeded or sodded to establish a more appealing lawn. You must wait at least three days after application in order to replant lawn grasses when using Roundup (read the label for official instructions). 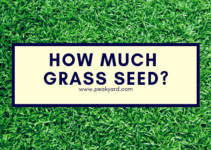 Planting sod or seed too soon after an application can be the reason why your grass ultimately failed to grow. We like to wait at least seven days before seeding or sodding to err on the side of caution. Roundup is a non-selective herbicide that will kill most plants that are exposed to its spray. You must be very careful where you spray it. It is not uncommon for people to confuse Roundup with other products that kill weeds but not grass (i.e. Ortho Weed B Gon). It is recommended to always read the label of any herbicide before spraying to avoid killing vegetation that was intended to remain alive. The active ingredients in Roundup are glyphosate and pelargonic acid. The National Pesticide Information Center has an excellent article on glyphosate that can be found here. The article explains how glyphosate works to kills vegetation and the potential harm it can cause to humans and the environment. Additionally, the University of California produced a nice write up on pelargonic acid and its usage for weed control, which can be found here. Both of these resources are very useful if you want to dig a bit deeper into the facts about these popular weed killing ingredients. Keep in mind that Roundup now also produces Roundup For Lawns. This product can be used to kill weeds but it will not kill the lawn when properly used. Roundup.com indicates that this product can kill up to 253 types of weeds including common weeds such as clover, crabgrass, dandelions, and nutsedge. If you plan on using this product, be sure to read the label to be sure it is compatible with your type of grass. Roundup For Lawns does not include the active ingredient glyphospate. It is a selective herbicide that won’t kill all vegetation in its path like a glyphospate herbicide. The active ingredients in Roundup For Lawns are MCPA, Quinclorac, Dicamba, and Sulfentrazone. These work to kill only the 253 types of weeds indicated by Roundup and not the your lush green lawn. When considering the best herbicide for your lawn, it is vitally important to read the label to understand what you are buying. You can image the displeasure someone would feel if they accidentally sprayed their lawn full of dandelions with Roundup containing glyphosate instead of Roundup For Lawns. Patches of dead grass are not only an eyesore but also a huge pain to reestablish grass in those dead areas. Taking an extra minute or so to read the label can potentially alleviate some major headaches down the road.